ENGLISH LANGUAGE REQUIREMENTS: The provision of Language, Literacy and Numeracy (LLN) assistance is a requirement under our Access and Equity Policy as well as 2007 AQTF Standards. Students will be required to sit a LLN test. The outcome of this assessment is to remain on the student’s file as evidence of initial LLN assessment. 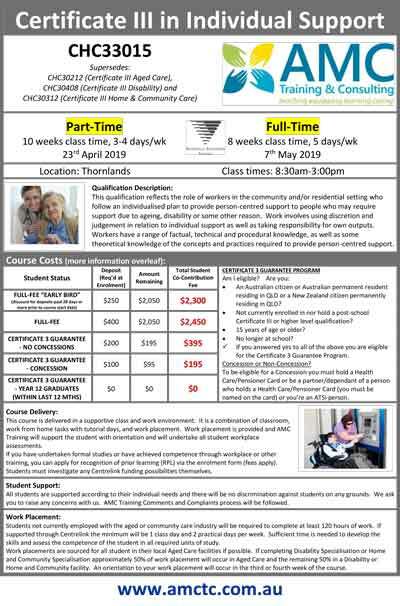 Students who need assistance will have further assessments made as required. RECOGNITION OF PRIOR LEARNING: Certified copies of formal qualifications accompanying your application. Where relevant to the course of current enrolment, some credits or exemptions may be granted. 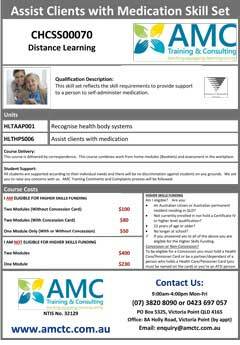 PAYMENT OF FEES: Enrolment can be via direct deposit or cheque made payable to AMC Training and Consulting. Course Fees can be full fees up front or Direct Debit Plan from Bank or Credit Card. Outstanding fees will be directed to a debt collector with a recovery fee added and enrolment will be suspended. Statements of attainment and/or qualifications will not be provided until any outstanding payment is finalised. Pre-course: Refund of enrolment fee minus a $250 admin fee. Full refund if providers fault. Duuring course: No refunds will be given once course has commenced & full course fees apply. Special circumstances outlined in the student handbook. Course Cancellation or AMC Cease to Trade: Full refund of course fees will be given. ACADEMIC PROGRESS REQUIREMENTS: Students undertaking studies with AMCTC must meet the course completion requirements - No greater than 12 months for completion. ASSESSMENT PROCEDURE: All courses require various assessments; tutorial exercises; written answers; portfolios; or demonstration. Students must complete all assessment requirements for all units to complete the requirements of the course. ACCESS TO STUDENT DETAILS: Information provided by students may be required to be provided to the Commonwealth and State Government agencies. DECLARATIONS & SIGNATURE: This application form must be signed and dated. PRIVACY STATEMENT: The information provided to AMC will only be used for training records of AMC and reports required to State and Commonwealth Departments. By signing this form you are consenting for AMC to provide this reporting information.